The weather may be dreary here in Chicago - winter in the Midwest tends to lean that way - but our apartment got a burst on sunshine courtesy of a new decor theme in the living room! Glee - Oh, season premiere, will you ever arrive? This time around, we filled the Taylor Hurricane (coincidentally also from C&B) with the yellow rocks and a chunky white candle from Pier 1. 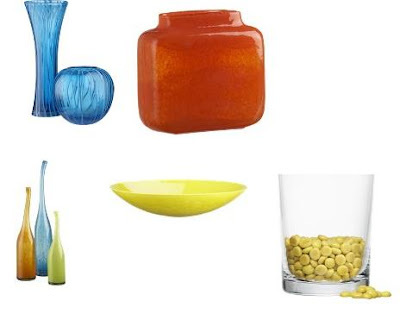 Ignore the placemats that are currently undervase - some lemony yellow round ones are on the way from Overstock.com! Quick tip: Scotch-guard placemats to keep from staining - these blue ones are near the end of their life because we didn't think to go that route! Our $25 Marshalls vase holds a display from the faux floral department of Michael's - in the fall we added some green elements, then over Christmas threw in some red and gold berries. Finally, the couch got a boost with some new pillows from Pier 1. Mistake: don't assume that the 25% off tag applies to every color pillow in the same style. Purple, blue or green? We would have seen some savings - alas, the yellow cushions were still full price. Already being at the register and all, it was just too much work to put them back and actually use some will power! We were just going to replace the green pillows, but once both styles were on the sofa we realized the colors worked out pretty well together - suddenly our sunshine theme had a citrus element. The only downside to switching up the themes on a regular basis? Our closet is getting quite full of fake flowers, candles and pillows. I love it all! I'm so impressed with your initiative. My holiday angel candle thing is still on display...maybe it's time for a trip to Crate and Barrel. P.S. SERIOUSLY Glee, it is time to come back. I miss you. Thanks Kara - here's how not thrifty I am: the rocks are $10 at C&B so we said "lets wait until they go on sale." Then we spent $6 for a bag of white and frosted rocks at JoAnn Fabrics because they didn't have yellow thinking we might get a yellow candle, but we didn't like that idea as much. So we waited a week and then went back to C&B and bought the yellow ones at full price. Sheesh.